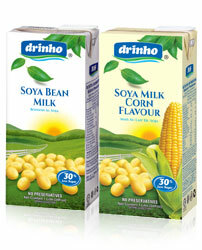 Drinho is an established brand in the Soya beverages industry. With the recent re-launched campaign in August 2011, Drinho Soya Bean Milk now comes with more soya goodness and better taste. But better doesn’t always cost more; the new DRINHO Soya Bean Milk is sold at the same price as before.